HissTank › Compatible Military Toys › Eagle Force Returns Trading Card Kickstarter Campaign Now Live! Eagle Force Returns Trading Card Kickstarter Campaign Now Live! You asked, they listened – The Eagle Force Returns Trading Card Set Kickstarter Campaign is now LIVE! 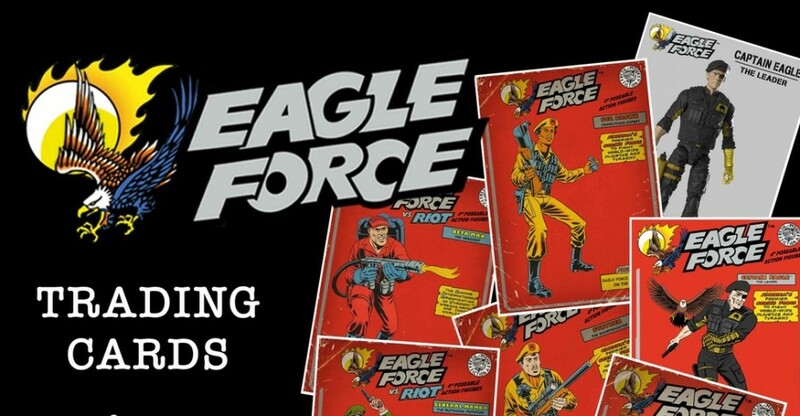 New and old Eagle Force fans alike now have an opportunity to add this fantastic 20 card trading card set to their collection, prior to the Eagle Force Returns action figure kickstarter campaign set to launch this Summer. Digital Standard Set Level – A $5 buy in gets you a digital PDF version of the set of 20 Eagle Force Returns Trading Cards sent to you via e-mail. Standard Set Level – $10 will earn you the right to a set of 20 Eagle Force Returns Trading Cards. Gold Eagle Level – For $25, you’ll get a Limited Edition Metal Card of Captain Eagle, plus the 20 Eagle Force Returns Trading Cards. Signed Golden Eagle Level – You can get a Limited Edition Metal Card of Captain Eagle, signed by Eagle Force designer Paul Kirchner, plus the set of Eagle Force Returns Trading Cards for $50. Every Level – The title says it all. For $100, you get a Limited Edition Metal Card of Captain Eagle, signed by Paul Kirchner. You’ll also get an Eagle Force sketch card and the set of 20 Eagle Force Returns Trading Cards. So much awesome and we haven’t even started talking about the Stretch Goal as of yet! If you want to know more, make sure to head on over to the Eagle Force Returns Trading Card Set Kickstarter Campaign and show your support! Once you do, let your fellow Tankers know by sounding off after the break!